Rental agreements and rates are influenced by the landowner’s costs, the tenant’s expected earnings, previous rates charged, competition for land, government programs, tax laws and the non-agricultural economy. The results of a statewide farmland leasing survey conducted in 2018 are reported here. 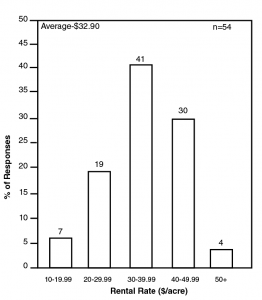 Respondents were recipients of a survey mailing by the Oklahoma Agricultural Statistics Service. Approximately 175 surveys were returned with usable data. Figure 1 shows the regions of the state used in reporting survey results: northwest, southwest, north-central and east. On average, crop cash lease agreements had been in effect for 11 years (Table 1) and 12 years for crop share lease agreements (Table 3). 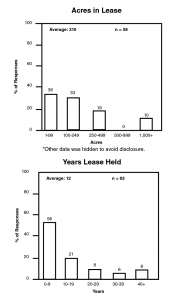 The statewide average lease size was 417 acres for cash leases and 310 acres for share leases. Median values are also noted, which shows the value in the middle of the survey responses. 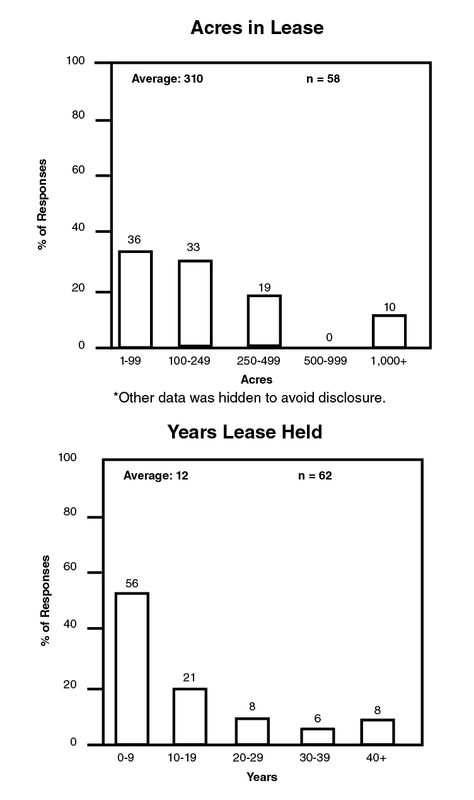 Figures 1a and 3a show the distribution of responses regarding acres and the years held for cash leases and share leases, respectively. Most tenants and landlords in Oklahoma appear to be satisfied with their lease agreements. Fifty-eight percent of respondents with cash lease agreements and 61 percent of respondents with crop share agreements classified their leasing agreements as either good or excellent from a standpoint of fairness in the most recent survey. These levels remain essentially unchanged since the 2014 and 2016 surveys, but lower than the 68 percent of respondents with cash lease or crop share agreements reported from the 2012 survey. In addition, 23 percent of respondents with cash lease agreements and 27 percent of respondents with crop share agreements classified their leasing agreements as adequate from the standpoint of fairness in the most recent survey. Table 1. Crop Cash Agreement Statistics by Region, 2018-19. 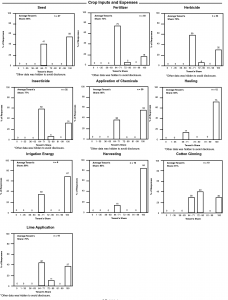 1 Median values that represent single observations are omitted. Figure 1a. Relative Frequency of Crop Cash Agreement Statistics, 2018-2019. Cash leases require a fixed payment, typically cash (or infrequently, a specified yield such as 10 bushels of wheat). Survey results document some regional differences in rental rates and average sizes of tracts rented. 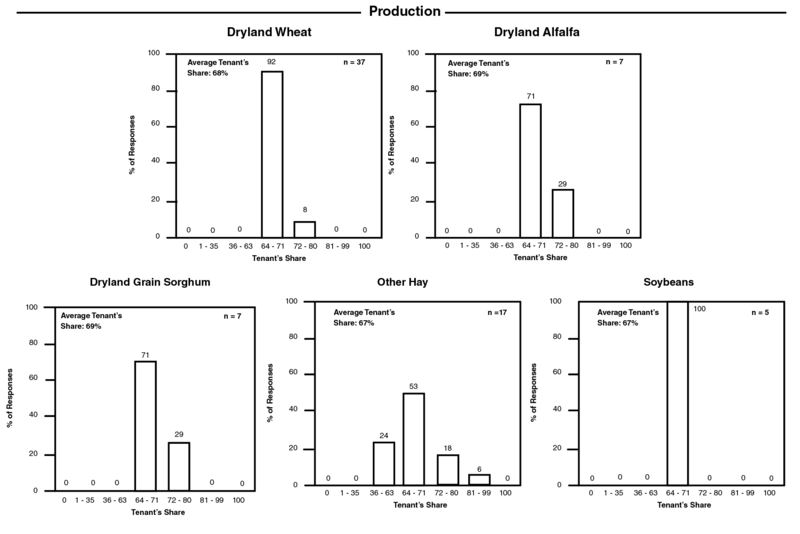 Cash rental rates for dryland wheat were highest in the north-central region of the state, averaging $34.01 per acre, compared to $30.80 to $31.29 in other regions of the state (Table 2). The state average of $32.90 declined about $3 per acre compared to the 2016 average of $36.01. 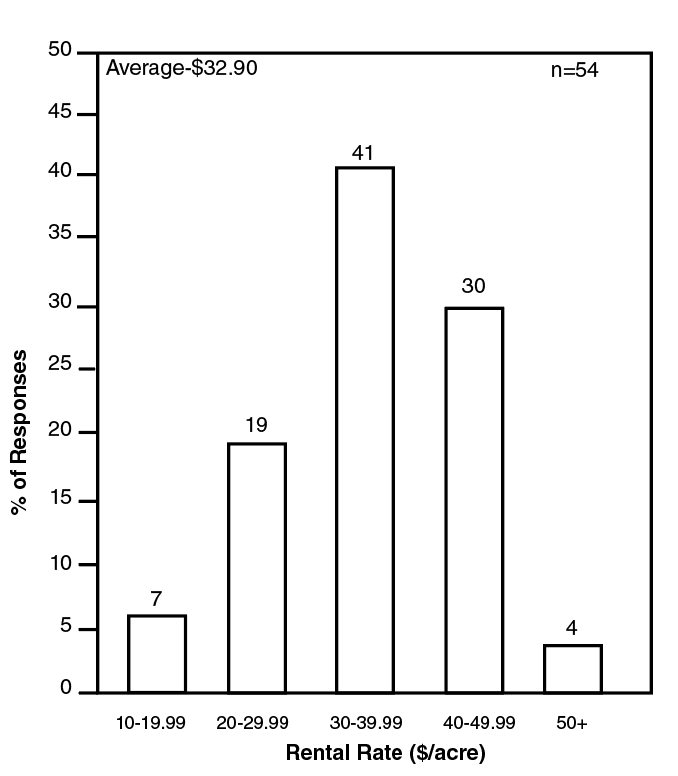 Figure 2 shows the distribution of responses (54) for dryland wheat cash rental rates. Seven percent of the respondents reported a rental rate between $10 and $19 per acre, 19 percent reported a rental rate between $20 and $29 per acre, 41 percent reported a rental rate between $30 and $39 per acre, 30 percent reported a rental rate between $40 and $49 per acre and 4 percent of the respondents reported a rental rate of $50 or more per acre. 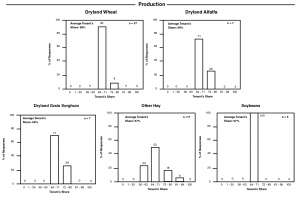 Dryland grain sorghum and alfalfa rates as reported in earlier publications are not available due to an insufficient number of responses. Table 2. State Crop Cash Rental Rates, 2018-19. Figure 2. Relative Frequency of Responses for Dryland Wheat Cash Rental Rates, 2018. Table 3. Crop Share Agreement Statistics by Region 2018-2019. In a crop share lease, certain costs are often shared in the same proportion that production is shared. In crop share leases statewide, the tenant on average receives around 2/3 of dryland wheat, alfalfa, grain sorghum or soybeans, while paying that or more of the fertilizer, herbicide, insecticide and chemical application expenses (Table 4). On average, the tenant pays nearly all harvesting (combining, hauling, cutting, raking, baling) expenses. Because lime has multi-year benefits, landowners may share in the cost of pay-all costs of lime application if a multi-year lease agreement is not in place. Figure 4a shows the distribution of survey responses regarding the tenant’s share of production. 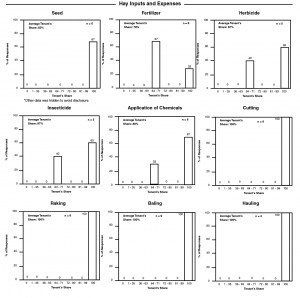 Figure 4b shows the distribution of responses for the tenant’s share of crop inputs and expenses. These graphs indicate that the tenant typically pays either 2/3 or all of the seed, fertilizer, herbicide, insecticide, chemical application, irrigation and lime costs. 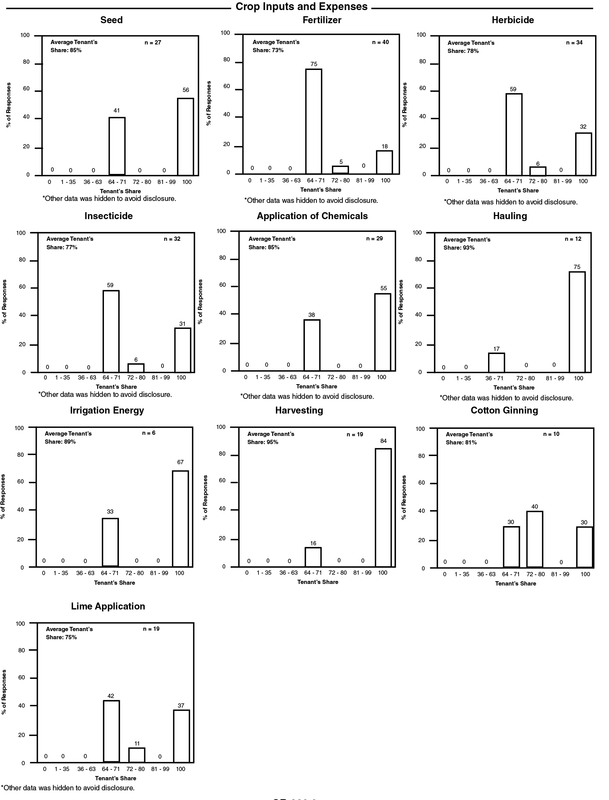 Chemical applications in particular are frequently paid entirely by the tenant. Compared to 2016-17 results, fewer tenants paid 100 percent of seed expenses. The graphs also show that the tenant typically pays all harvesting and hauling costs. 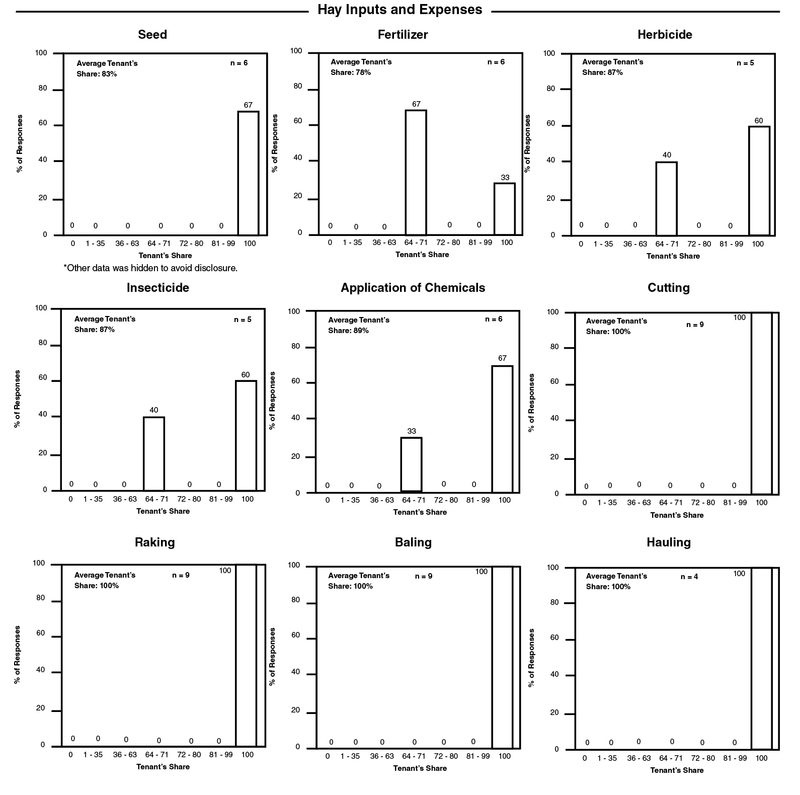 Figure 4c shows the distribution of responses for hay inputs and expenses. The results for hay are similar to crops in that the tenant typically pays all harvesting (cutting, raking and baling) and hauling costs. Table 4. Relative Frequency of Crop Share Agreement Statistics, 2018-2019. 2 Rental shares of 100% of the crop for the tenant or zero percent of expenses are generally special situations, usually reflecting concessions or unusual circumstances in another part of the lease. However, as lime improves the soil and this improvement is retained by the landlord if the lease is terminated, it is not unusual for the landlord to pay all lime expenses. Figure 4a. Relative frequency of responses for items in cropland share agreements, 2018-19. Figure 4b. Relative frequency of responses for items in cropland share agreements, 2018-19. Figure 4c. Relative frequency of responses for items in cropland share agreements, 2018-19. Many lease agreements specify terms and conditions beyond the rental rate, which affect the value of the lease and the “real” rental rate. For instance, tenants may or may not be allowed to hunt, harvest pecans, graze cattle, cut timber, use buildings, improvements and lease out hunting privileges. Lime application costs or similar costs for improvements in which the benefits are shared over a number of years may be shared by the landlord and tenant, or if the tenant pays for them initially, repaid by the landlord at a fixed rate per year. Tenants may be required to maintain fences, spray weeds annually, provide liability insurance, share oil field damages, maintain terraces and leave strips of grain in the field for game. Landlords may provide a well and water, fencing material or land for a mobile home. Tenants may ask for several months notice if the landlord wishes to terminate the lease agreement. In some cases, leases contain an option to buy with rental payments applied to the purchase price. Historical and Regional Perspective Table 5 provides historical data on cropland rental rates for Oklahoma, Kansas, Arkansas and Texas for 2009-2018 as reported by the USDA National Agricultural Statistics Service (NASS). County level cropland rental rate data is available at: http://www.nass.usda.gov/Statistics_by_State/Oklahoma/ Publications/County_Estimates/index.asp. The next bi-annual USDA Cash Rent Survey will be available with the 2019 release in September 2019. Table 5. Average Gross Cash Rent (Dollars per Acre) for Cropland, Selected States, 2009-2018. Source: USDA/NASS, Quick Stats, https://quickstats.nass.usda.gov. “Fair” rents must be negotiated between tenant and landlord. Regional or state average rental rates may be used as a beginning point for discussion and negotiation of rental rates. However, differences in land quality, improvements and restrictions on land use can greatly impact the value of potential leases. Likewise, differences in family living expenses and hired labor costs can be substantial for different operations, affecting the maximum rental bids. New legal restrictions and liability factors may instigate changes in future farm lease agreements. Some farm management firms include language that explicitly requires the tenant to be a good steward of the land. The tenant is expected to follow label restrictions in the use of pesticides, to remain in compliance with the farm’s conservation plan, and to dispose of wastes in a manner approved by the Environmental Protection Agency. Some leases already stipulate precisely what fertilizers, pesticides, and seed may be used on the property. Both landlords and tenants must be aware of changing environmental laws and regulations to avoid potentially costly liabilities. To help educate landlords and tenants with equitable lease agreements and current best management practices, visit the Oklahoma State University (OSU) Ag Land Lease website at http://www.aglandlease.info or http://www.aglease.info. A joint effort between OSU’s Plant and Soil Sciences and Agricultural Economics Departments, the website contains a wide assortment of farm management spreadsheet tools, lease information and forms, rental rate and land value resources, legal and tax considerations plus the latest production practices in Oklahoma. In addition to publications, worksheets and free downloadable sample lease forms are available on the site.